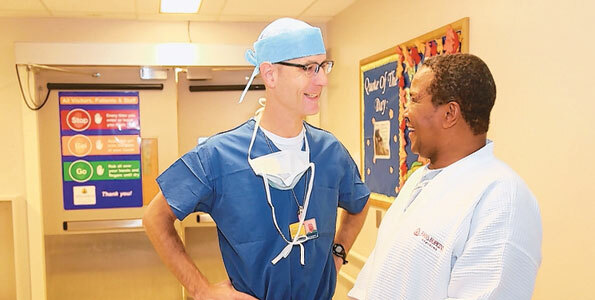 President Jakaya Kikwete chats with Dr Edward Shaeffer on arrival at the Johns Hopkins Hospital in the US for surgery. Dar es Salaam. President Jakaya Kikwete has been successfully operated on in the United States, Ikulu announced yesterday. An official a statement issued by the Directorate of Presidential Communication said the Head of State had underwent a prostate surgery at the John Hopkins Hospital in Baltimore, Maryland. Mr Kikwete left the country on Thursday evening for the US for what his handlers said was a medical check-up. The operation under specialist doctors was carried out on Saturday and lasted one and a half hours. The State House said medical experts who checked the President recommended a surgery. “The operation took about one hour and a half…..it has been a successful surgery. The President is doing well though he is still in the ward under close supervision of doctors for further observation,” the statement noted. The communiqué pledged that Tanzanians will be given proper updates with regard to the health of their leader. The prostate is an organ forming part of the male reproductive system. It is located immediately below the bladder and just in front of the bowel. Its main function is to produce fluid which protects and enriches sperm. In younger men, the prostate is about the size of a walnut. It is doughnut shaped as it surrounds the beginning of the urethra, the tube that conveys urine from the bladder to the male organ. The nerves that control erections surround the prostate.